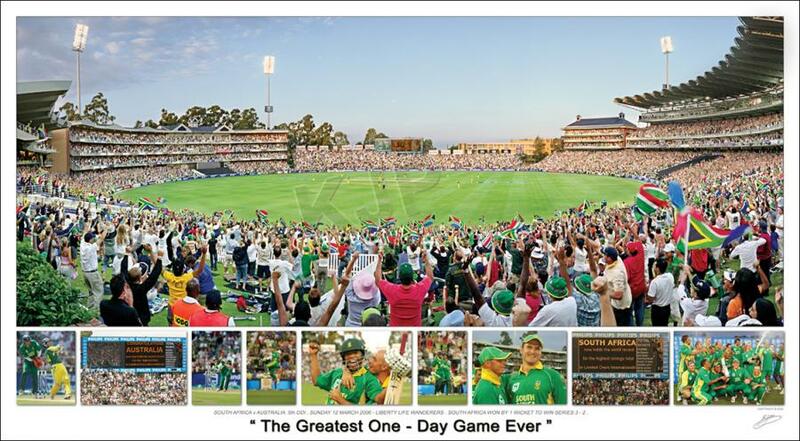 The 5th One Day International cricket match between South Africa and Australia was played on 12 March 2006 at New Wanderers Stadium. Australia batted first. This match broke many records in Cricket. Australia's final score was 434 for 4 off their 50 overs. South Africa's score was 438/9, winning by one wicket with one ball to spare. Herschelle Gibbs batted at number 3 and reached his 16th ODI hundred in 79 balls, beating his own South African record for the fastest score of a hundred that had previously been off 84 balls against Zimbabwe. Gibbs scored the second highest total by a South African with 175 off 111 balls. This photo represents Mark Boucher's winning runs.